Larrey was born in the little village of Beaudéan, in the Pyrenees as the son of a shoemaker, who later moved to Bordeaux. Larrey was orphaned at the age of 13. He was then raised by his uncle Alexis, who was chief surgeon in Toulouse. After serving a 6-year apprenticeship, he went to Paris to study under Pierre-Joseph Desault, who was chief surgeon at the Hôtel-Dieu de Paris. His studies were cut short by war. Larrey went to Brest where he was appointed in the navy and gave lectures. In 1788 he was sent to Newfoundland and Labrador. In 1789 he was back in Paris and finished his thesis on Eskimos. He cooperated with Jean-Nicolas Corvisart, Marie François Xavier Bichat and Raphaël Bienvenu Sabatier in Les Invalides. In 1792, during the War of the First Coalition he joined the Army of the Rhine. In Mainz he met with Samuel Thomas von Sömmerring. During this time, Larrey initiated the modern method of army surgery, field hospitals and the system of army ambulance corps. After seeing the speed with which the carriages of the French flying artillery maneuvered across the battlefields, Larrey adapted them as ambulance volantes (“Flying ambulances”) for rapid transport of the wounded and manned them with trained crews of drivers, corpsmen and litterbearers. At the Battle of Metz (1793) Larrey successfully demonstrated the value of field ambulances. 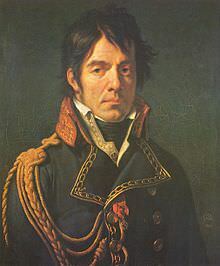 The quartermaster-general Jacques-Pierre Orillard de Villemanzy ordered prototypes to be built, after which ambulances would be supplied to all the Republic’s armies. The politicians heard of this, and ordered a national contest to find the best design, thus delaying their delivery by over two years. Larrey also increased the mobility and improved the organization of field hospitals, effectively creating a forerunner of the modern MASH units. He established a rule for the triage of war casualties, treating the wounded according to the seriousness of their injuries and urgency of need for medical care, regardless of their rank or nationality. Soldiers of enemy armies, as well as those of the French and their allies, were treated. 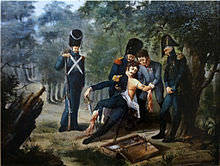 Lerrey amputating the arm and leg of colonel Rebsomen at Hanau (1813). In 1794 he was sent to Toulon, where he met for the first time with Napoleon. He married the paintress Marie-Élisabeth Laville-Leroux. In Spain he fell ill and was sent back to Paris. He became professor at Val-de-Grâce but was appointed as surgeon-in-chief of the Napoleonic armies in Italy in 1797, and went to Egypt the year after. In the Battle of Acre he was wounded. In 1801 he was back in France. Larrey was made a Commandeur of the Légion d’honneur on 12 May 1807. He joined in the Battle of Aspern-Essling, where he operated on Marshall Jean Lannes and amputated one of his legs in two minutes. He became the favorite of the Emperor, who commented, “If the army ever erects a monument to express its gratitude, it should do so in honor of Larrey”, he was ennobled as a Baron on the field of Wagram in 1809. In 1811, Baron Larrey co-led the surgical team that performed a pre-anesthetic mastectomy on Frances Burney in Paris. Her detailed account of this operation gives insight into early 19th century doctor-patient relationships, and early surgical methods in the home of the patient. Larrey was involved in the French invasion of Russia. When Napoleon was sent to Elba, Larrey proposed to join him, but the former Emperor refused. 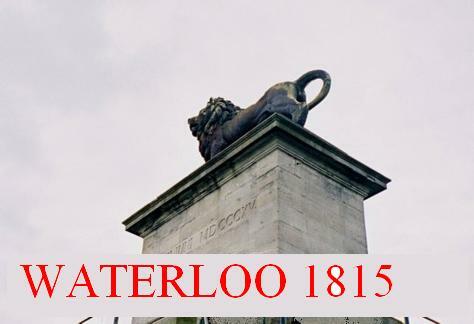 At Waterloo in 1815 his courage under fire was noticed by the Duke of Wellington who ordered his soldiers not to fire in his direction so as to “give the brave man time to gather up the wounded” and saluted “the courage and devotion of an age that is no longer ours”. Trying to escape to the French border, Larrey was taken prisoner by the Prussians who wanted to execute him on the spot. Larrey was recognized by one of the German surgeons, who pleaded for his life. Perhaps partly because he had saved the life of Blücher’s son when he was wounded near Dresden and taken prisoner by the French, he was pardoned, invited to Blücher’s dinner table as a guest and sent back to France with money and proper clothes. He devoted the remainder of his life to writing, but after the death of Napoleon he started a new medical career in the army as chief-surgeon. In 1826 he visited England, received well by British surgeons. In 1829 he was appointed in the Institut de France. In 1842 he went to Algiers, together with his son, and fell ill. Larrey died on his way back in Lyon. His corpse was taken to Paris and buried at Père-Lachaise, but his remains were transferred to Les Invalides and re-interred near Napoleon’s tomb in December 1992. Larrey’s writings are still regarded as valuable sources of surgical and medical knowledge and have been translated into all modern languages. Between 1800 and 1840 at least 28 books or articles were published. His son Hippolyte (born 1808) was surgeon-in-ordinary to the emperor Napoleon III. The Dominique-Jean Larrey Award is the North Atlantic Alliance’s highest medical honour. It is bestowed annually by NATO’s senior medical body, the Committee of Chiefs of Military Medical Services in NATO (COMEDS), which is composed of the Surgeons General of NATO and partner nations. It is awarded in recognition of a significant and lasting contribution to NATO multi-nationality and/or interoperability, or to improvements in the provision of health care in NATO missions in the areas of medical support or healthcare development. 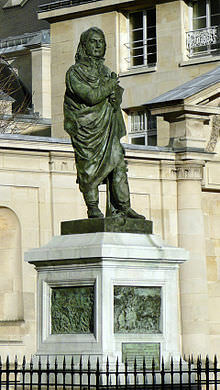 His statue in bronze, as sculpted by David d’Angers in 1843, is standing in the courtyard outside the Val-de-Grâce military hospital.